I loved “The Citadel at the center of Time” which is a perfect Conan adventure. The advantage may be that Thomas was adapting Robert E Howard stories for many of the tales here, whereas he was often working from scratch on the regular series (although “Citadel” is a Thomas original, and admittedly REH‘s later Conan stories were less engaging than the very earliest ones). WHOA there, Kumar: you sure about that? Sure, you have "The Servants of Bit-Yakin," and "Man-Eaters of Zamboula" to contend with, but "The People of the Black Circle," "Beyond the Black River," The Hour of the Dragon and "Red Nails" - all later stories - were less engaging than the earliest? If anything, I'd say it was the middle-stories that were the "less engaging" ones, and even then, it isn't as simple as that. "Citadel at the Center of Time" is about as Jack Kirby as Savage Sword got during the Thomas run. So... no, not a perfect Conan adventure, really. Preach on, brother. Alcala is really awesome: his work on "Slithering Shadow" (ugh, hate that title) was brilliant. Look at that. It's masterful. It's almost like an intaglio or woodcut. 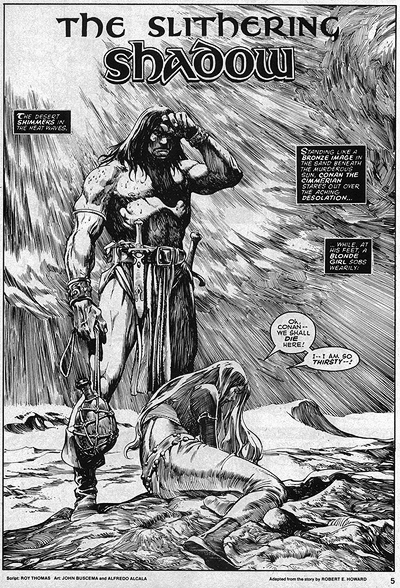 Another weird thing is that I feel like I’ve read the REH adaptations — like “Black Colossus” — multiple times before in different adaptations, and some of them really recently: the original REH stories, the current Dark Horse versions, maybe also even in Marvel’s regular Conan series as well. What’s interesting about the current Dark Horse series though is that they are really filling in all the gaps. For example, in one story here, Conan mentions being the last of the living “Free Companions” and surviving in the marshes for days. It’s about two or three sentences of dialog, but just a few months back, the DH series spent THREE ISSUES on this storyline! Everyone will have their preference, but I kind of preferred the DH approach. While I love the idea of what Dark Horse is doing, it's the execution that bothers me. The idea of expanding elements of, say, "Rogues in the House" - where we are more acquainted with the hapless revolutionaries, Murilo and Nabonidus - is an excellent idea: however, I don't like how they effectively transformed Mitraism into some ham-fisted Catholic Church allegory in the process. In "The God in the Bowl," I appreciate the introduction of Kalanthes earlier in the story: that said, I don't like how they depicted him, as I think portraying a Stygian priest as black (and we don't know Kalanthes was Stygian at all, but let's go with that) goes entirely against the theocratic caste-driven nature of Stygia. And I certainly love the idea of making Born on the Battlefield based on the bits and pieces we know of Conan's origin as opposed to earlier iterations like Conan the Barbarian or Conan of Venarium (a shame they didn't bother with that for The Hand of Nergal and The Hall of the Dead), but that doesn't mean I like the stupidly powerful Aquiromians, the wimpification of Cimmerian women and the fact that Venarium is essentially Conan's fault. So I like the DH approach, just not how they went about it. Alcala's hatching technique is more akin to Franklin Booth then Albrtecht durer. You know, just a little bit of basic research goes a long way when you're writing a review and you don't end up sounding like a nerdy fanboy who doesn't know what he is talking about. Too right, syon: Christopher Lee as Solomon Kane is just perfect casting. M.D., I didn't even think to look for who Alcala evokes, but Booth's a good one. Durer isn't too far off, though: he did a couple of very detailed intaglios. I heard the comparison between Alcala and Gustave Dore too... by the way what is exactly an intaglio, a kind of sculpture of wood? Intaglio is a lot like woodcut, except instead of wood, metal is engraved on to provide the printing surface. It is hard to think of alternatives for Conan in 1982, surprisingly enough, though I think Brown would've been good.